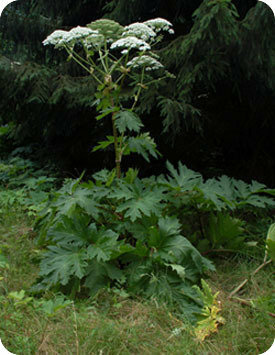 Edible Wild Food Blog » Giant Hogweed: Beware! Giant hogweed (Heracleum mantegazzianum) is rapidly becoming a serious concern in many areas across Canada (and the U.S.) because it can burn skin and cause permanent blindness. It can’t be stated enough, contact with this weed’s watery sap can be very dangerous. It can cause severe blistering on the skin and permanent scarring that resembles a chemical burn or fire. What’s worse is that even a tiny trace of the sap to an eye can singe the cornea which causes temporary or permanent blindness. Chemicals in the giant hogweed’s sap include: furocoumarins (carcinogenic) and teratogenic (they can cause cancer and birth defects). Most provinces do not have authorized weed inspectors to destroy this plant because it currently does not impinge on agricultural lands. Giant hogweed is rampant in many areas of Europe and especially Great Britain. This plant is native to Central Asia and it was brought to Europe and North America as a botanical curiosity in the 19th and 20th centuries. It typically grows on riverbanks, ditches and roadsides. Do not attempt removing this plant unless you have sought professional help. Those who do remove this plant wear protective suits, goggles, rubber gloves and proper footwear. The sap of this plant is found all over the plant and anyone who uses a weed whacker and is not wearing protective gear is at risk. The sap chemically bonds with skin when exposed to sunlight and within 48 hours can lead to inflammation, redness, itching, blisters, and eventually purplish and black scars. This is called phytophotodermatitis. Giant Hogweed can reach a very impressive height of 5 metres when flowering. The purple-spotted hollow green bristly stems can be 5 to 10 centimetres in diameter. Leaves are deeply lobed and toothed. The large blossom consists of numerous white flowers clustered in an umbrella-shaped head that have been known to reach to 120 centimetres across. Most plant parts are covered in stiff white hairs that are filled with sap. Giant hogweed looks very similar to the native and widespread cow parsnip and hogweed cow parsnip. It is (superficially) similar to Angelica species including the common, native purple stem angelica and the introduced Woodland angelica. It might also be mistaken for other Angelica species such as valerian, lovage, wild parsnip, and Queen Anne’s lace among others. The seeds of this dangerous plant may take several years to germinate and survive in the soil for up to fifteen years. Once a seed has germinated it takes two to five years of growth before the plant produces flowers. During the first year, the plant produces a rosette of leaves to 1 m high. As the plant grows a large taproot, thick hollow stems and large deeply lobed leaves are formed. Giant hogweed flowers just once in its lifetime (unless the flower clusters are damaged before opening). If you think you have discovered giant hogweed do not take any chances. Call your local town or city offices and let them know. If you live in the province of Ontario and you think you have giant hogweed on your property or if you see it in your community please call the Invading Species Hotline at 1-800-563-7711 or report the sighting online. You will be asked to send in photos for identification. Do not collect parts of the plant for identification. That I don’t know. Check with a local company that kills weeds.